Advanced Electret Media for maximal filtration efficiency & is light weight. 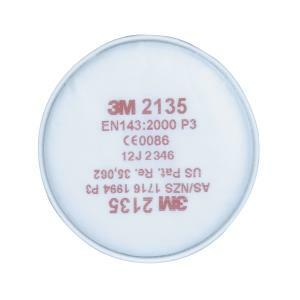 The 3M™ Disc Filter 2135 can be used in industries where excess levels of particulates are present in the workplace atmosphere. The 2135 filter has been classified as a P3 particulate filter, and is thus able to be used for protection from mechanically and/or thermally generated particulates i.e. it provides protection against dusts, mists and fumes, as well as for toxic materials like beryllium. Approved as a P3 filter. Lighter than conventional filters that provide comparable protection. Durable, water-resistant and flame retardant.